What is the most comfortable style of baby carrier? Babywearing Wednesdays – Quick Question What is the Most Comfortable Style of Carrier? 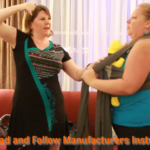 In this episode we talk with Arie, from The Canadian Babywearing School about what it THE most comfortable style of carrier.